Croatia has definitely become one of my favourite destinations of late. I was there last in 2013 just before I went on my year long travels, and loved it so much that I had to go back. I usually like to explore new countries and places I’ve never been before, but Croatia was just so appealing that I had to go back. With its crystal clear water that is perfect for swimming and snorkelling to the exquisite food, it was a no brainer really. For this trip, Síofra and I planned to see some new places along with one or two favourites from our last trip. After doing some research we decided to check out the city of Zadar, Plitvice National Park, Split and the islands; Korcula, Hvar and Brac. Here is everything we did/saw/ate, you name it, in the 2 weeks we were there. 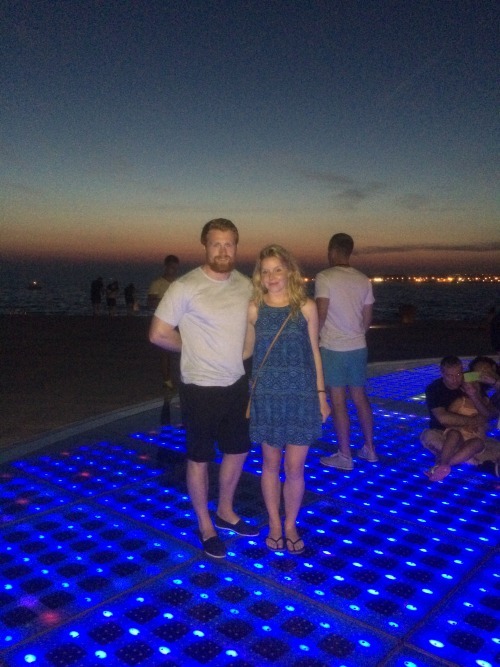 We took a flight on a Friday and arrived in Zadar pretty late so we literally found our hotel and waited to explore until the following day. The hotel was about a 20 minute walk from the city centre (old town), however our hotel provided bicycles free of charge, so we rolled down there in 5 minutes. We were able to lock the bikes up just before you enter the old town and left them there for the day. During the day we explored the cobblestone laneways, climbed the bell tower of St Anastasia’s Cathedral and sat in the square, people-watching whilst eating pizza slices and having a drink. We also sat by the famous sea organ and went for a few swims off the promenade. That evening we had dinner in a restaurant called Bruschetta. It had been recommended in another blog that I read, so we decided to check it out. The food was a little pricey (for Croatian standards) but very good. I got grilled sea bass and shrimp and Síofra was able to get a gluten-free dish of steak with veg and chips. 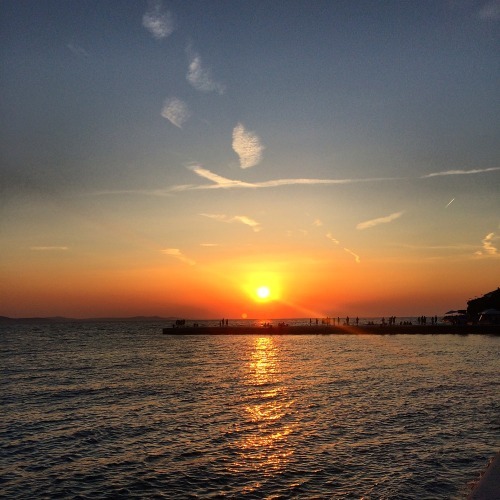 After this we rushed to the sea organ to watch Zadar’s famous sun set with a few beers we picked up in the supermarket. It gets very crowded for the sunset. My advice is to arrive early or else find a spot on the pier before the sea organ for the same view with less people. It won’t disappoint. Once it gets dark the sun salutation starts to light up and this is a great spectacle that you should check out. After this, we headed to the Garden Bar where we got some great cocktails and looked out over Zadar from the walls. Once we finished here we headed to the Ledana Lounge and Bar Zadar where the party went on till the early hours. 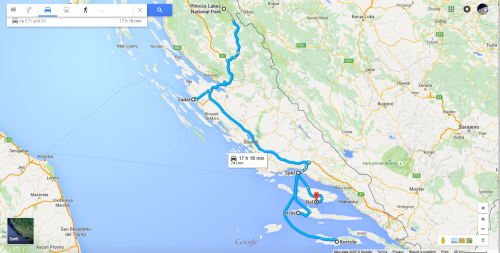 The next day we rented a car from Uni-rent and drove from Zadar to Plitvice National Park. It cost roughly €130 for 48hrs. This included insurance, excess cover and a GPS. We checked multiple companies online but uni-rent offered the best rates. The office is located in the old town so it’s very convenient for picking up. It took roughly 2hrs to drive there and you drive mainly on the A1 motorway for most of the journey so it was an easy enough drive. We arrived at our accommodation the Golden lakes rooms before 12 but were unable to check in. Our host gave us some great tips for the park and said it would take about 6hrs to complete. We parked the car at entrance number 2 for the day and made our way into the park. Make sure you park here, it’s a better car park. As per our hosts advice we took the bus from station 2 to station 3 in the upper lakes. From there we followed path H downwards. We came across some amazing waterfalls and were blown away by the colours of the lakes. Eventually after some time we reached boat station 2 and took it to station 3 to finish out the lower lakes. The lower lakes were even better than the upper lakes. They are very picturesque and offer some great opportunities for photos. There are a few harder climbs to do here but nothing too difficult. The views are worth it. We finally reached bus station 1 and took our last trip to where we started the day. We were both wrecked after 5+hrs of walking in the heat but it was definitely worth seeing. ****Tip – Wear comfy shoes. It’s a long day on your feet and the board walks can be dodgy at times. Bring food and water, you’ll save money and take lots of pictures, you’ll want to see them again later. The only negative thing about the day is you cannot swim in the lakes, which trust me is very difficult to hold back. There isn’t a lot around the national park so don’t expect to be doing too much else. There are a few restaurants around but most of them are located in the hotels and guest houses so prepare yourself. The next day we had a 4 hour drive to Split. Unfortunately we didn’t get to spend too long in Split but the old town and the palace are definitely worth a walk around. Some of the restaurants and ice cream parlours looked amazing. Nightlife is also meant to be very good here. Split harbour is a hub for the ferries to the islands and also connects many cities by bus so it’s always busy. We both said we would like to spend more time here the next time. The catamaran ferry takes 75 minutes to get to the island of Hvar and takes just over 3hrs to get to Korcula. We stayed in Guesthouse Franica in Korcula town, which was just beside the port and old town. It was reasonably priced but very average. We ended up booking the wrong room type so we were a little disappointed with what we got. We decided to explore the old town for a bit before stopping at a bar called Salvantes where there was some live music that ran into the early hours. They do some good juices and smoothies here in the daytime too. 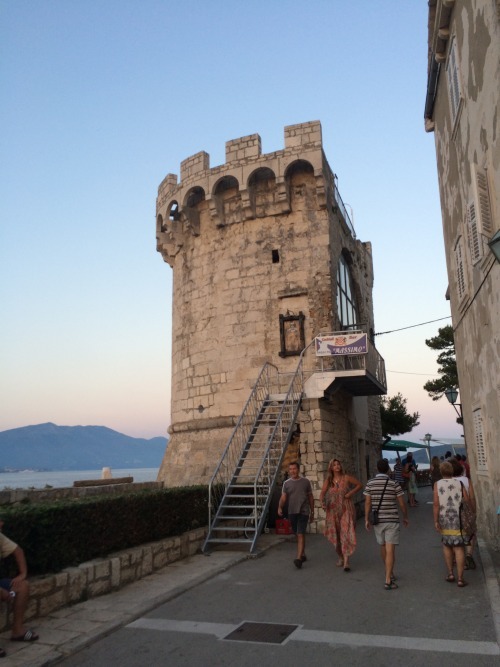 The next day we got up and explored the old town and Korcula town a little bit more. After this we decided to take a bus to the nearby town of Lombarda, which is known for having better beaches. A return bus ticket cost 25 kuna per person and the timetable ran every hour from the bus station beside the old town. Lombarda is a very small town with a few nice beaches, restaurants and shops. We chilled on the rocks and swam for a while before picking up some lunch and some ice creams and then made our way back to Korcula. We showered and got ready before heading to Massimo cocktail bar for some sunset drinks. The bar is on top of one of the old turrets and offers the best views of the sunset. Drinks get hoisted up by ropes because the stairs are too steep to carry them up so it’s pretty novel to see. It’s not that pricey for drinks but get there early as it gets very crowded. After this we went for dinner in one of the many restaurants along the old town walls. I can’t remember the name of it but they all offered similar menus of seafood, meat and pasta dishes. We both got different kinds of grilled fish and both were great. We went back to our accommodation for some pre drinks and then headed to the strip of bars where it was already getting lively. Sail Croatia was in town, so there were some large crowds around. These all headed to Boogie Jungle (a nightclub just outside the town) later on in the night so the bars started to empty out at around 1. Arka Bar and Dos Locos were good bars. We woke the next day, got some breakfast and took a taxi boat to the island of Badija just off Korcula. It cost us 50 kuna per person for a return ticket. Return taxis started at 4pm and ran every hour till 7pm. The island is quiet and there are some great spots to swim, snorkel and relax. It’s a nice place to get away from the crowds back in Korcula. One bit of advice bring food with you or eat before you come as there is only one restaurant on the island and it’s overpriced. That night we went for dinner in Bistro Gajeta along the old town wall. Our waiter was extremely helpful and humorous. He recommended we try the homemade pasta, which was pretty good. After dinner we climbed the bell tower in the middle of the old town which gave great views of the harbour and the island. We climbed it at night time so visibility wasn’t that good so I would recommend climbing it in the daylight. Arka bar was busy again so we headed there for a few drinks and played some pool before calling it a night. Our ferry to Hvar the following day was in the afternoon so we just lay out in the sun and went swimming until then. We used Airbnb for our accommodation in Hvar and it was amazing. We were met by our host off the ferry and she gave us some information about Hvar; where to go and places to eat etc. before driving us in her car to the apartment. On the way she stopped at a viewpoint and pointed out the nearby Pakleni Islands. We arrived at the apartment and everything about it was great, from the location and the amenities to the amazing view of the harbour. Our host was very nice. She made us traditional Croatian doughnuts and gave us some fresh lavender when we were leaving, which was a very nice touch. If your staying in Hvar definitely check this place out. The first day we arrived we lay out in the sun and went swimming beside the Amfora Hotel. That night we went to Mizarola, an Italian restaurant in the main square. It’s good food and relatively cheap. We even got free dessert. After walking around for a bit we went to BB club on the seafront for some drinks. It’s located beside Carpe Diem Bar. They had a dj and a live saxophonist playing. The following day we decided to rent a Scooter Bike. We booked it from Fontana travel agency on the main pier and it cost 200 kuna for 24hrs and you could also have 2 drivers at no additional cost. We started in Hvar town, then had a quick pit stop in Milna before heading to Zaraće where we sat in the sun, snorkelled and had some great iced coffee in one of the small restaurants. We then bypassed Sv. Nedjelja and Stari Grad and made our way to Jelsa and Vrboska. Jelsa is a small town with lots of restaurants around the harbour and seemed nice but quiet. We didn’t walk around for too long but I’m sure there’s lots of things to do there. We made the short trip back to Vrboska and headed straight for the beach, where we relaxed in the evening sun. We returned to Hvar town as the sun was setting. We paid for petrol twice during the day, each time only costing around 14 kuna. It was money well spent as we saw some great beaches and places that you wouldn’t see otherwise. As we got back pretty late most of the restaurants were already packed, but we eventually got a table at Bistro Marinero, where we got our daily dose of grilled fish. Afterwards we went to Ka’lavanda Music Bar Hvar. It’s located down a laneway at the top of the square near the bus station. It has an unreal cocktail menu and plays good tunes. However, beware the drinks are pricey. The following day we went back to Fontana Travel agency, but this time it was to enquire about boat hire. We got a small 5hp boat with a canopy and it cost us 450 kuna for the day which included petrol. We also received a discount because we had booked the scooter bikes with them the day before. After getting a quick tutorial on driving, parking and anchoring the boat we were on our way. We sailed around the Pakleni Islands for the day; Jerolim, Markinkovac (Stipanska, Mlini and Ždrilca) and Palmižana. 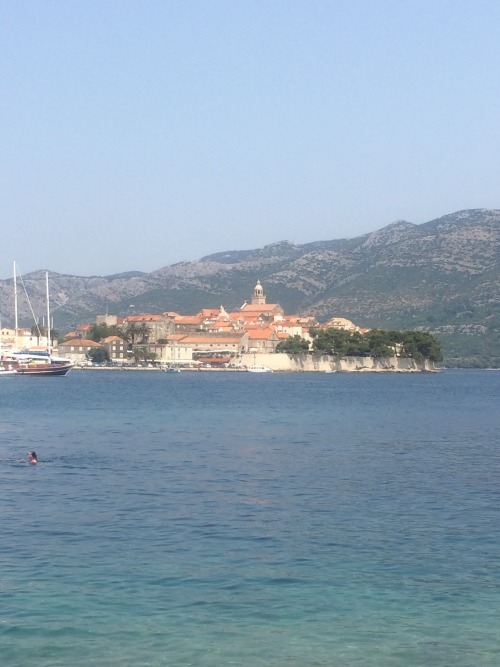 We stopped at Ždrilca for a few hours and got some food and then we anchored in the bay of Palmižana and Jerolim for some swimming and snorkelling. It was a great day and something I highly recommend doing. There are many other options for renting boats including having your own skipper. We liked doing our own thing but see what works best for you. That evening we got an early dinner, went back to the apartment and had a few pre-drinks before hitting Carpe Diem and Carpe Diem Beach Bar. Carpe Diem Beach Bar is a must when you’re in Hvar. From around 1am taxi boats depart the main pier and bring you to an island just off Hvar. All that is on the island is a nightclub, which includes multiple bars, lounge areas, a swimming pool and even food. It costs 150 kuna for entry to the beach bar and a return taxi boat. The taxi boats run regularly until 5am. Other nightclubs and bars worth checking out are Pink Champagne Nightclub and Kiva Bar which is good for cheap cocktails at the start of the night. After an active few days we decided to head to Hula Hula bar (located past Hotel Amfora) for lunch and some much-needed R&R. Hula Hula bar is also a must when you’re in Hvar. It does great food, has great drinks and great “craic” (as we say in Ireland). We sat out in the sun for the afternoon before heading back to Hula Hula bar for some drinks and to watch the sunset. For dinner we went back to the square. We decided to try the restaurant, Ex Rocco this time. They have great food and the service is very good. It was our favourite of the restaurants in the main square. Afterwards we went to Slasticarna for ice cream. Our host had recommended this place and it didn’t disappoint. It’s located opposite where the taxi boats go from. There are lots of umbrellas and tables outside, you can’t miss it! For our last full day in Hvar we got up early and climbed to the fort. The fort overlooks Hvar and the nearby Pakleni Islands and offers some amazing views. Although the trek up there can be tough in the heat the views make it all worthwhile. My tip is to go before the sun gets too hot so before 10am. After grabbing some quick-lunch we made our way down to the beach, near Hula Hula Bar, and we rented some sun beds. It cost us 100 Kuna per person. Go early in the day to make sure you get value for your money. After spending the day chilling in the sun, snorkelling and sipping on a few beers we went to enjoy one last sunset in Hvar. We went to Falko Bar which is out past Hula Hula Bar. It has a more chilled out and relaxed atmosphere with hammocks and bean bags. Being our last night in Hvar we decided to go to the #1 restaurant, Dalmatino Hvar. It had incredible customer service and very tasty food. They even gave us some delicious free bread to start and flavoured brandy samples after each course. The restaurant is a fish and steak house so you can’t go wrong with your choice. I advise you leave your name with the wait staff early in the evening or you’ll be waiting for a table for a long time. It is a very popular spot and very busy so definitely get there early. After walking off our dinner we went back to Ka’lavanda Music Bar Hvar for some drinks and to chill out. The quickest and cheapest option to get to Bol from Hvar is by taking an excursion boat. It costs 100 kuna per person and takes roughly 2hrs. Tickets can be purchased in Fontana travel agency (on the main pier, where we rented the scooter and boat). The boat leaves at 3.30pm, so it means you still get half a day in Hvar and the evening in Bol which much more favourable than the other options. Bol is a relatively small town. It’s 2km in length from the port to the famous Zlatni Rat beach. We stayed in Hotel Daniela which was ideally located in between both. The room was basic but had all the essentials such as fresh towels, air conditioning and a fridge. Also included in the room price was free breakfast. The breakfast was simple but tasty with a nice selection of hot and cold food. The town itself is pretty small and most of the restaurants and bars are located along the seafront. The first night we chose the restaurant Topolino as the menu looked good and it was very busy. After walking around for a bit we decided to stop in Varadero Cocktail Bar on the seafront and chilled, listening to the music. There are a lot of beaches in Bol, including the famous Zlatni Rat Beach, where we went to both days. The first day we paid 150 kuna for two beds and an umbrella as the sun was just too hot to sit in. There’s plenty of food/drink options and activities to do on the beach including; an aqua park, para-sailing, SUP-ing and kayaking. 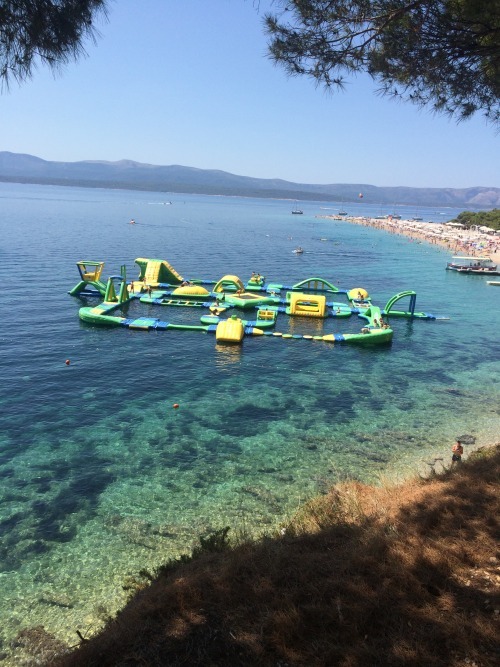 We tried our hand at the Aqua park, which was great fun but a lot harder than it looks. Pricing is reasonable and they offer different durations too. That night we went to a restaurant called Vagabundo. It’s located at the start of the town if you’re coming from Zlatni Rat. The menu has a great selection of meat and fish options. Prices were above average but worth it. We ended up in Varadero cocktail bar again that night after dinner. The second day at the beach we took shelter in the trees. This was much better as we didn’t have to pay for beds and an umbrella and got a nice breeze too. Make sure you check out Aura cocktail bar at the end of Zlatni Rat too. It’s a nice place to chill out at the end of a long day at the beach. They have beach parties regularly during July and August so make sure you check them out. They have different acts and performers playing throughout the summer. For our last night in Bol and Croatia we went to Bistro Pumparela for dinner. It’s located at the end of the pier where the ferries pull in. I went for one of the house specials, which was Beef Steak cooked on a hot rock. You can also choose Tuna steak. It was an interesting concept and one that I wanted to try for a while. We had one last stroll around before heading back home to pack. We took the 6.30am ferry from Bol to Split. It costs 55 Kuna per person and takes roughly 60 minutes. This is the cheapest, quickest and best option for getting back to the mainland. If you don’t do this you have to get a bus or an expensive taxi to the other ports; Supeter or Milna and then get a ferry, which is both timely and costly. Once we arrived in Split we made our way to the bus terminal (which is located at the end of the pier) as we had to catch a bus back to Zadar for our flight home. The buses run very regularly as there are several different bus companies handling this route. It cost 110 kuna per person for the bus trip to Zadar and it took roughly 4 hrs despite the timetable saying it would be quicker. Make sure you leave yourself enough time to get back as they do tend to deviate from the scheduled times. The bus drops you at the bus station in Zadar which is about a 20 minute walk or a 2 minute taxi to the old town (city centre). Buses then run from the old town (next to the ferry office) or the bus station to the airport for 25 Kuna per person and the journey takes 20 minutes. So there you have it, a full two-week itinerary for the beautiful Croatia. I couldn’t recommend the place any more. If reading this or looking at the pictures hasn’t made you want to put it next on your list of places to visit, I don’t know what will. If you have any questions about anything, leave a comment and I’ll get back to you.